35th Anniversary of Original Radiotron Hip Hop Youth Center. A Stage Of The Arts, Inc. production in association with the Universal Hip-Hop Museum. Saturday, June 23; 6 to10 PM Honoring the 35th celebration of the Radiotron Youth Center and the importance of holding safe creative space for our youth. Free to the general public. CHRIS "THE GLOVE" TAYLOR , BOOGALOO SHRIMP, COCO . MCs ABSTRACT RUDE, SHUGA REA, KONSCIOUS, VICIOUS LEE, PROJECT BLOWED. URBAN CULTURE SERVICE RECOGNITION to Ben Cadwell, KAOS NETWORK and PROJECT BLOWED and B. Hall, "THE GOOD LIFE FOOD CENTRE"
Hosted by MC PATCHEZ CLOWNZ, featuring SANDRO the Magician, CLAY MAZING Emergency Circus, SPOTLIGHT Dancing Clown, TOSCA Cyr Wheel, Contortionist, Stilt Walker...and more. A program of Stage Of The Arts, Inc. founded 1982. SOTA began presenting shows at a storefront theater on Bonny Brae Street. The Youth Break Center aka Radiotron was born in the Westlake/MacArthur Park neighborhood summer of 1983 when Performer/ Director Carmelo Alvarez rented a building with hardwood floors and stage to open performing arts center for local youth. Unaware that space was used by Radio Club early Hip Hop underground club featuring pioneer Rapper Ice T and DJ The Glove. Carmelo was soon approached by Connon Films to shoot the movie Breakin. A year later, Carmelo and center youth marched to City Hall and staged a demonstration to save the youth center from demolition. Breakin 2 Electric Boogaloo was based on the real-life struggle to save the space. In the Hollywood movie ending the youth save their center but in reality the building was razed to make mini mall and the youth returned to streets. Thirty-five years later we celebrate The Radiotron Youth Cultural Center, where the legacy of popping and graffiti art exploded into the breakdancing fever of Hip Hop decades. Since 1978 Carmelo Alvarez has been a leading Youth and Cultural Advocate who has opened 13 creative art spaces (2 in Tijuana Mexico). 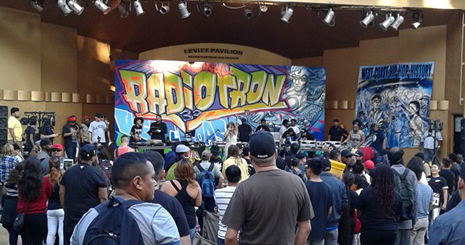 35th OG RADIOTRON is made possible in part by a grant from the City of Los Angeles, Department of Cultural Affairs, and the Mortimer and Mimi Levitt Foundation. Stage Of The Arts, Inc. mission is to promote and develop multiethnic, international arts and cultural awareness in the City of Los Angeles, and to establish programs for research and community development, providing working space and affordable housing for artists, including traditional arts forms as well as communication technology based on computer applications. Thank You for promoting Los Angeles contemporary.